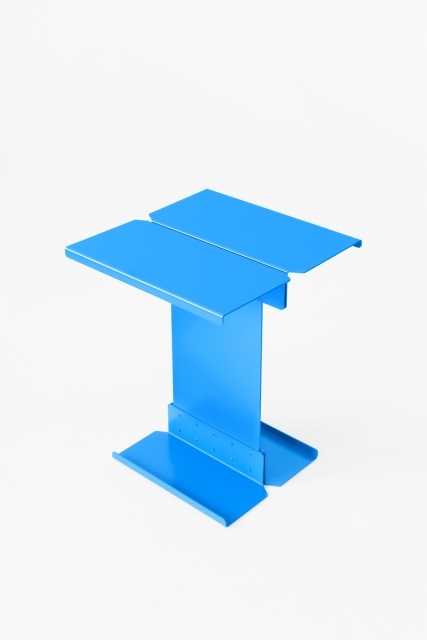 Five is a side table made in iron sheet and aluminium, and finished in matte paint. It’s a rational and futuristic design; it consists of five pieces joined together with rivets that give the table an industrial feel. This design reflects on how robots would design furniture in a near future, focusing exclusively on its technological logic and its industrial processes, obliterating the emotional component of human designs. That’s why Five shows itself as it is, exposing each component and its industrial processes. The base is ideal to place magazines and books. In addition, the upper part has a groove that allows to organize the cables of electronic devices. Five works as a nightstand or as a side table, and it’s suitable for all types of spaces. Iron and aluminium coated sheet. White, Black and Sky blue. 40,4 × 40 × 50,5 cm (L × W × H). 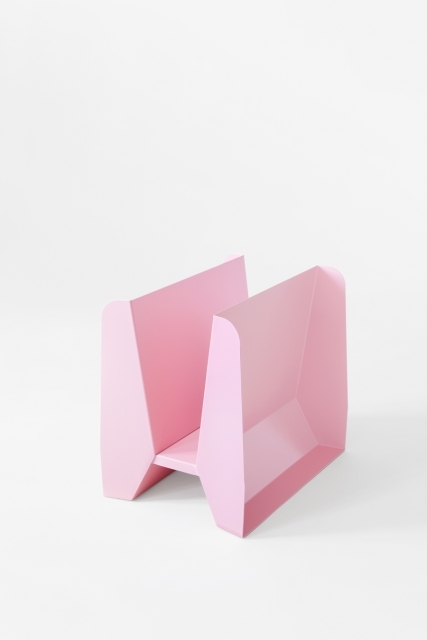 The functionality of Adler is double: it’s a sculpture magazine rack. Made in iron sheet and painted in matte, it is formed by three metallic volumes that are structured following a series of folds. The piece is a homage to Alexander Calder and his urban “Stabiles” sculptures, which, unlike his mobiles, didn’t move. These sculptures by the US artist made in metallic sheet would represent different animals; Adler, as a tribute, symbolizes an eagle. Red, Mint green, Light pink and Honey yellow. 40 × 29 × 36 cm (L × W × H). Melancholia is a series of handmade glass vases. 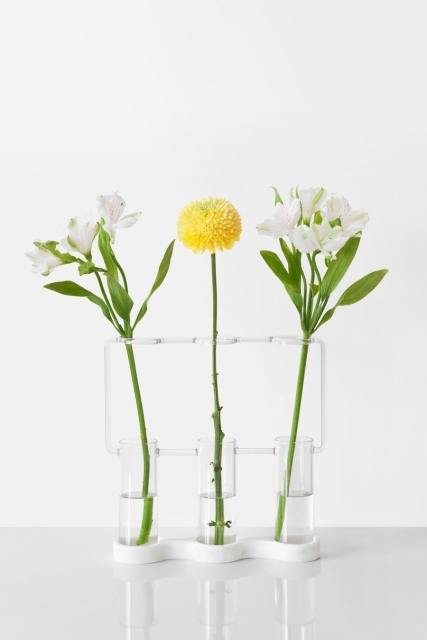 Inspired by laboratory test tubes, they turn flowers into study and contemplation elements. There are no stridencies, nor distractions. Only the element. A ring holds the flower, leaf or branch highlighting its beauty this way. Both in the individual format as in the triple format, the espectator will be able to contemplate the element in its singularity. 63 × 42 × 232 mm (L × W × H). It is advised to clean them in the dishwasher or handwash carefully. Cubit is an armchair that in delicate sturdiness joins materials such as iron, wood, foams, wool upholstery, varnished MDF and brass; elements that interact and communicate between them creating a very particular aesthetic language. 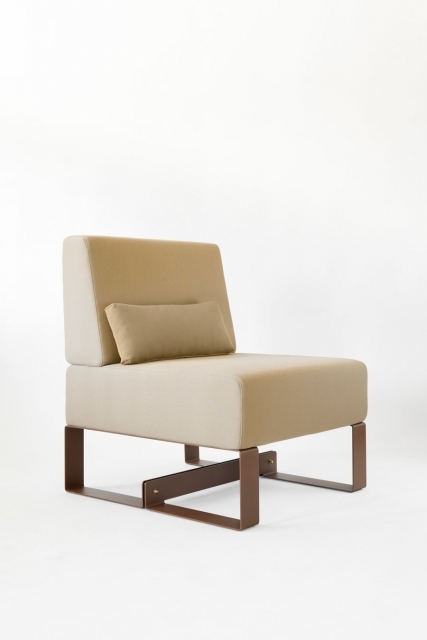 The compact functionality and lineal beauty take shape in this armchair. The metallic base of this piece includes a decorative crossbar that is inspired in the 1970s architecture. On it, different density foams and contained volumes make out of this design a welcoming and comfortable armchair. Click here to check the colour chart. Iron, MDF, wood, foams, wool and brass. 67 × 77 × 85,5 cm (L × W × H). Glass. Base in matt carrara marble. 246 × 42 × 232 mm (L × W × H). With base: 246 × 55 × 238 mm. Orion is a side table made in resine composite. It is versatile, because its design allows objects to be placed inside its inferior cavity as well as on top of it. This piece works as a bedside table or as a side table for a couch or a sofa. Orion combines 3D machining and craft processes in its making. 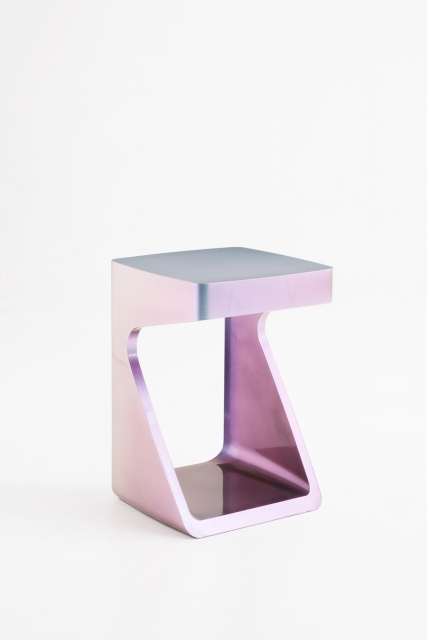 Its lacquered finish, which is handmade, adds an optical effect that perfectly matches the futurist spirit of this piece of furniture, because this side table changes colours depending on the observer’s point of view and the light. From a subtle turquoise, through bright silvers and red hues, Orion mutates in its curves. Limited edition of 25 units. From a subtle turquoise, through bright silvers and red hues. 35 × 35 × 50 cm (L × W × H). It is advised to clean it with a wet cloth adding neutral soap if necessary. 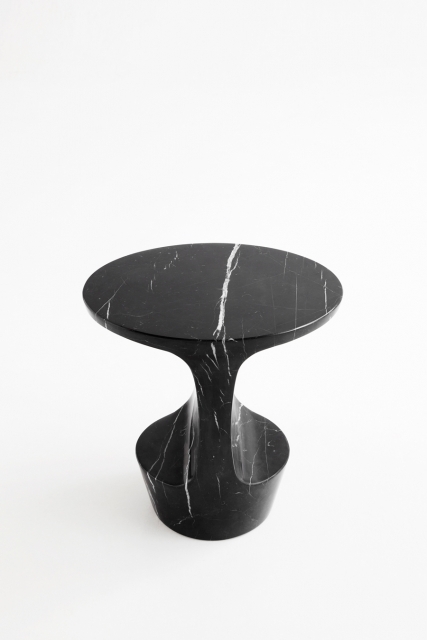 Atlas is a side table made out of a Marquina marble block, extracted in the North of Spain. The piece takes its name after the young titan of the greek mythology that was fated to sustain the pillars that separated the Earth from Heaven and its finishing is absolutely handmade. This futuristic sculptural work, perfect as a bedside table or to stand by a sofa or an armchair, changes depending where it is looked from thanks to its polished finishing and dynamic shape. It can also be made out of Carrara white marble. Marquina marble or Carrara marble. Marquina black or Carrara white. 42 × 32 × 42 cm (L × W × H). if necessary, but without using any chemicals on it. 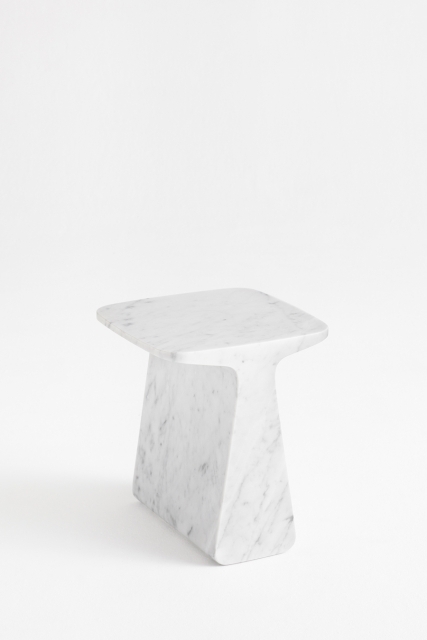 Pura is a side table extracted from a Carrara marble block. Solid and contained, either like a table, a base or a stool, Pura emanates presence and stillness. It's available in white and black marble and its finish is matte. Carrara marble or Marquina Marble. 35 ×35 × 40 cm (L × W × H). 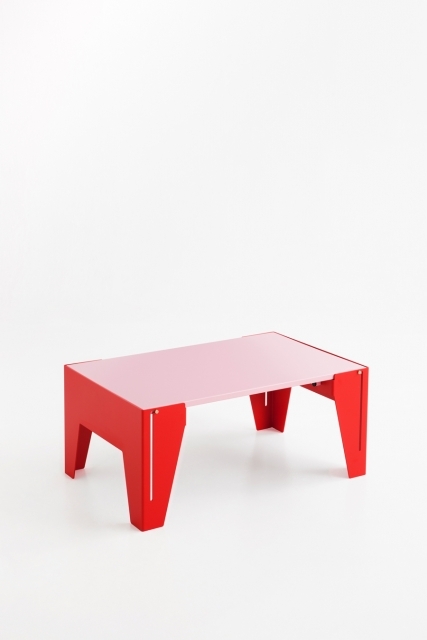 Falcon is a coffee table made out of lacquered wood, painted aluminium sheet and brass. It’s based on the ideas of transformation and efficiency; its goal is to offer a functional design. Falcon changes like Nature itself and has two positions: the folded one, that takes the minimum space, and the unfolded one, which enables it to become a coffee table and that can be set to maintain its position. The aluminium legs have slots in which the brass axis articulate, allowing Falcon’s transformation. Falcon responds to contemporary design, clean lines and the functionality that bets for space efficiency. Textured painted aluminium sheet, lacquered wood and brass. Orange Brown & Nut Brown. 80 × 51 × 35,5 cm (L × W × H). 89 × 51 × 14,3 cm (L × W × H). 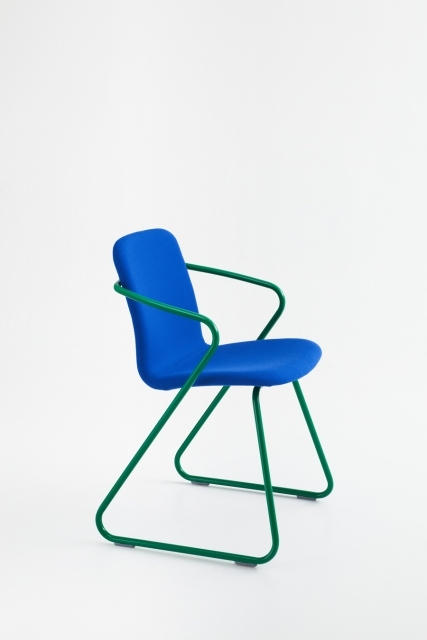 Cobra is a dining chair made of iron pipe and plywood. Cobra leads you to conversation; it’s flexible and adaptable to your movements while you’re sitting down. Also available upholstered in wool. Iron pipe, plywood and wool fabric. Natural oak & oyster white. Natural oak & signal black. Blue upholstery & Mint green. Ask for the colour cards. 53 × 51 × 79 cm (L × W × H). The iconic lamp by Adolfo Abejón comes back in a reissue of three new colours (zinc yellow, grey and black) and new details that lengthen its life and add another stage to its bright story. 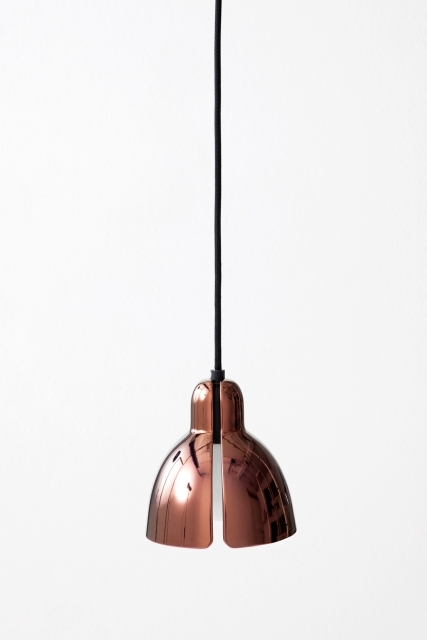 Slim is a lamp collection made of painted iron pipe. This decorative design is inspired by the classic shaded lamp but it is reduced to its essence. 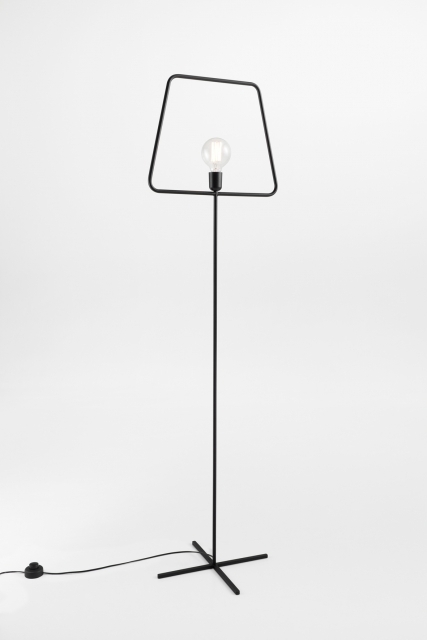 The lampshade is transformed into an outline which frames and protects the bulb. Slim L: 1 × E27 75 Watt max. Slim S: 1 × E14 75 Watt max. 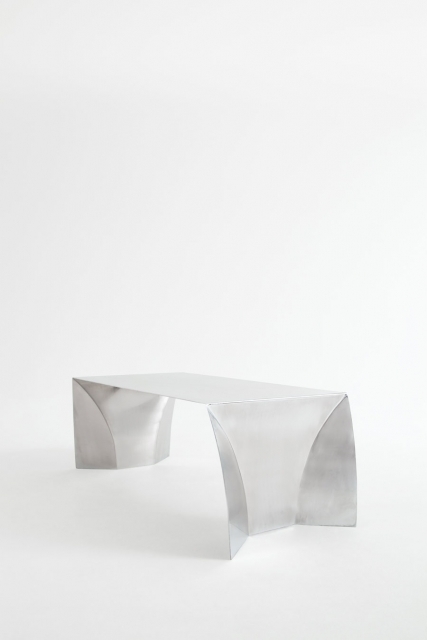 Kate is a coffee table, but, above all, it's a feeling for sculpture handmade in an stainless steel sheet. Kate is born performing metallic origami, following a series of folds and unions that end up creating a functional volume. 122 × 55 × 41 cm (L × W × H). 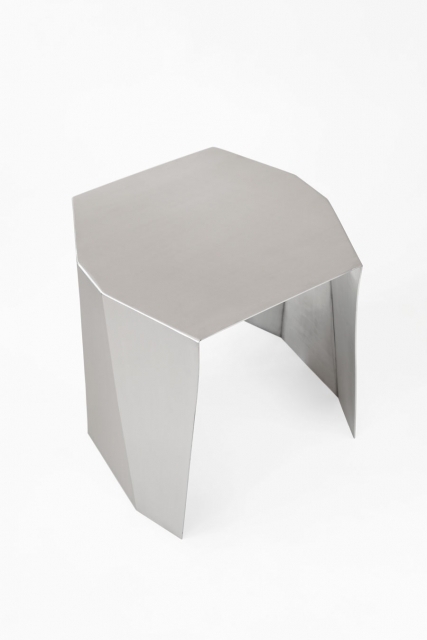 Katy is a side table, but, above all, it's a feeling for sculpture handmade in a stainless steel sheet. Katy is born performing metallic origami, following a series of folds and unions that end up creating a functional volume. Limited serie of 10 pieces. 45 × 40 × 45 cm (L × W × H). Castella Bench is a stool bench handmade in nappa leather, MDF and iron bar. 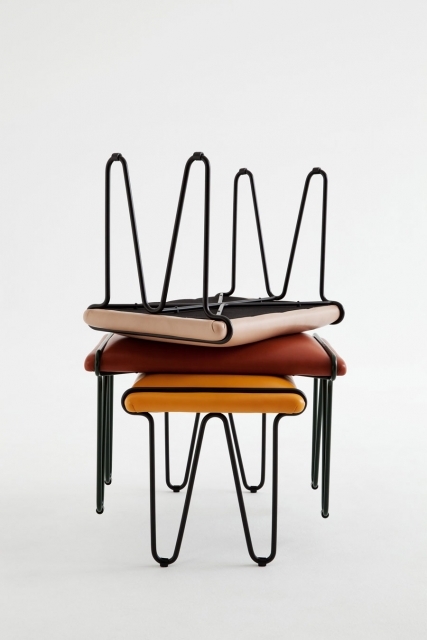 The iron structure shapes the peculiar silhouette of its legs holding tight its padded board. A comfortable and cool way of sitting. Nappa leather, MDF and iron bar. Nappa: mustard, grey beige and tobacco. Structure: black or fir green. Venice is a porcelain lampshade that quickly turns a simple ceiling light point into a luminaire. Secure the small safety part onto the wire by adjusting the set screw and place the lampshade over it. This way you will enjoy warm light anywhere in your home. 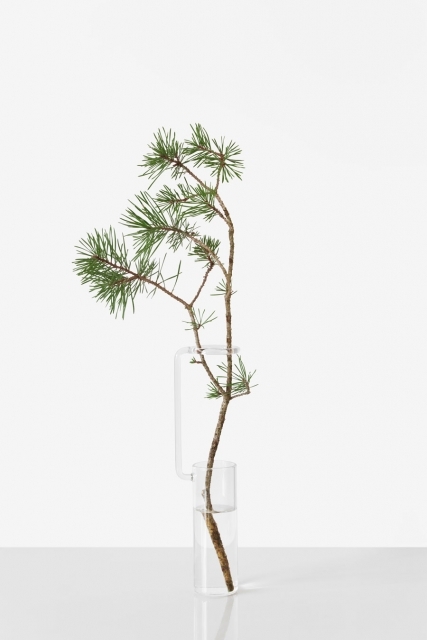 This product is handmade and small variations are normal due to the manufacturing processes. 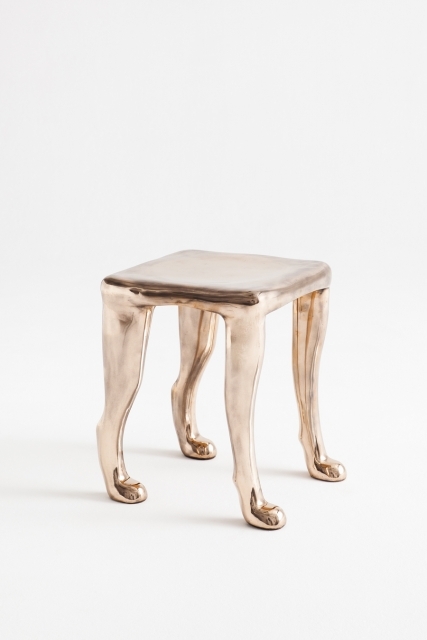 Khamon is a cast bronze stool built as an sculpture. The inspiration for Khamon comes from the willingness to dignify the stool as a piece of furniture often forgotten. It combines a polished finish with a classic bronze patina. Limited edition of 8 signed sculptures. 40 × 36 × 44 cm (L × W × H). 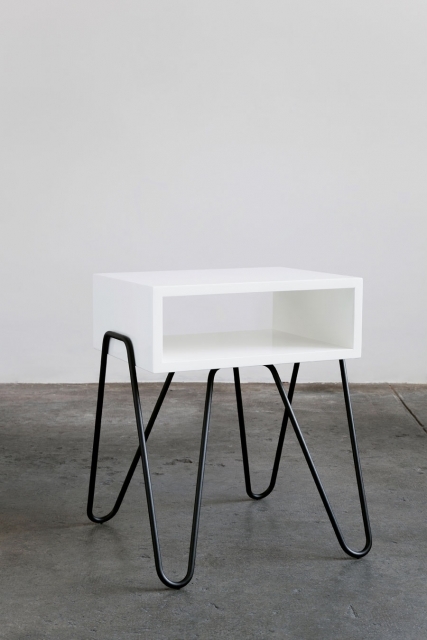 Handy is a side table made of lacquered MDF and iron bar. It also works as a bedside table that allows you to store and easily access everyday items. The drawer is held by the iron structure that embraces it creating two handles to move the table. Drawer in MDF. Structure in iron bar. White lacquered MDF-Black painted iron bar. Black lacquered MDF-Brass finish iron bar. "When I was a kid I used to see, in some homes, how naked bulbs would hang from the ceiling, including the wire and the socket. I didn't understand why people wouldn't install a lamp. This design is dedicated to those who want to light their homes without having to install a complicated lamp." 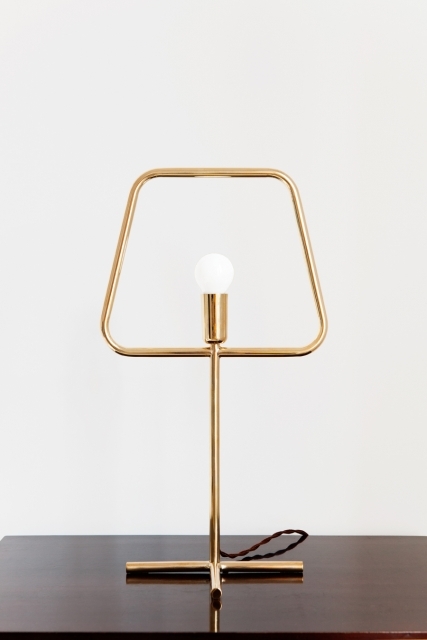 Slim Brass is a handmade brass table lamp. It's a special edition of the Slim Collection with a unique added look. 1 × E14 75 Watt max. 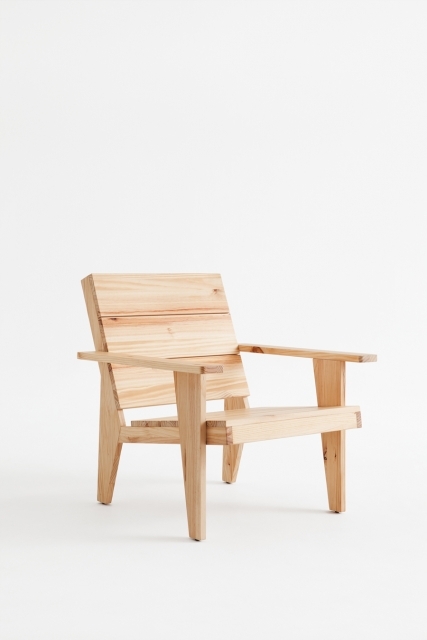 Woody is a handmade fir wood patio armchair with a humble soul, a noble mind and reminiscing the Adirondack chair. Woody's back also incorporates a handle to drag it around easily. Available in matt varnish finish and painted white as well. 76 × 72 × 74 cm (L × W × H). 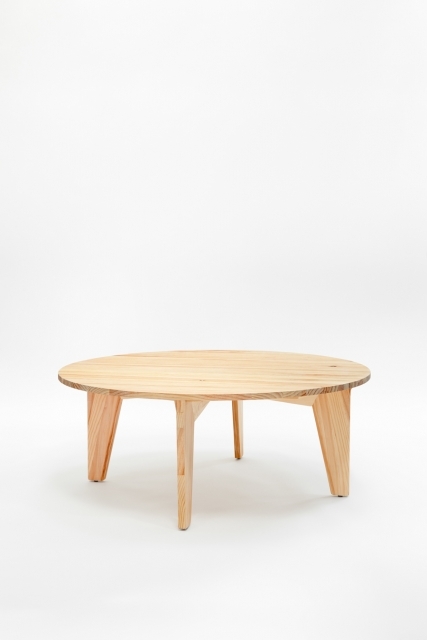 Wooda is a handmade fir wood coffee table. Its robust design makes it perfect for outdoor spaces and its simplicity helps creating a warm and cozy atmosphere, specially if surrounded by the Woody chair. 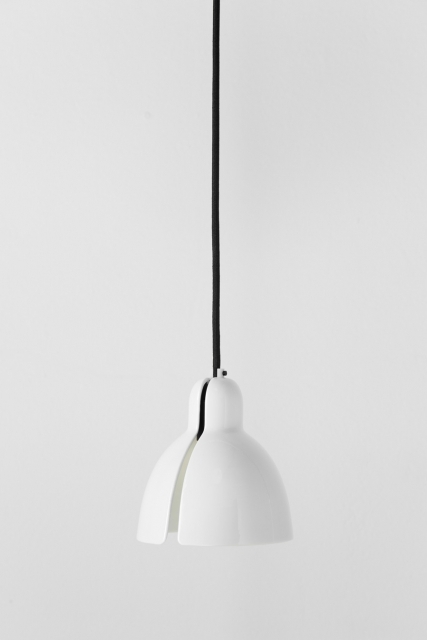 Built using traditional woodwork, Wooda is also available painted in white. Ø100 × 40 cm (Ø × H).